Top quality carpet racking to suit all your storage requirements at highly competitive prices, designed, supplied and installed across the UK. 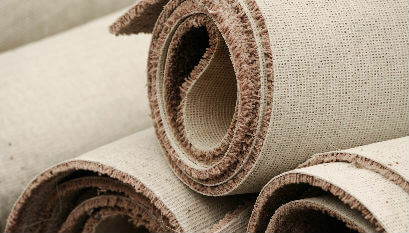 The principle function of carpet racking is to store rolls of carpet and other textiles such as felt and cloth. 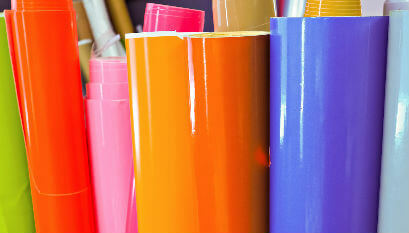 Vinyl rolls are easily damaged, carpet racking prevents the risk of damage caused by bending and stacking. Bubble wrap, cling film and other packaging products can be stored safely and accessed quickly and efficiently using carpet racking. 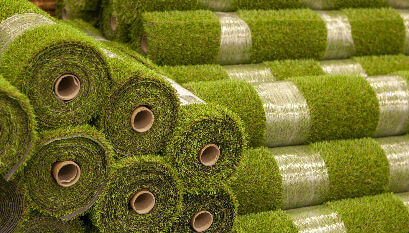 The latest generation of artificial grass is extremely heavy and bulky, carpet racking enables safe and secure storage of these items. ''Right from the first point of contact BSE UK were so helpful, they have been very accommodating throughout the whole process. 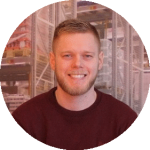 George had good product knowledge, and we love the fact that BSE UK are local. The fitters did a fantastic job too, they were SEIRS registered and all had CSCS cards so I had total confidence in them to get the job done to a high standard, and they did." JAMES, DEPOT MANAGER, PENTAGON PLAY. 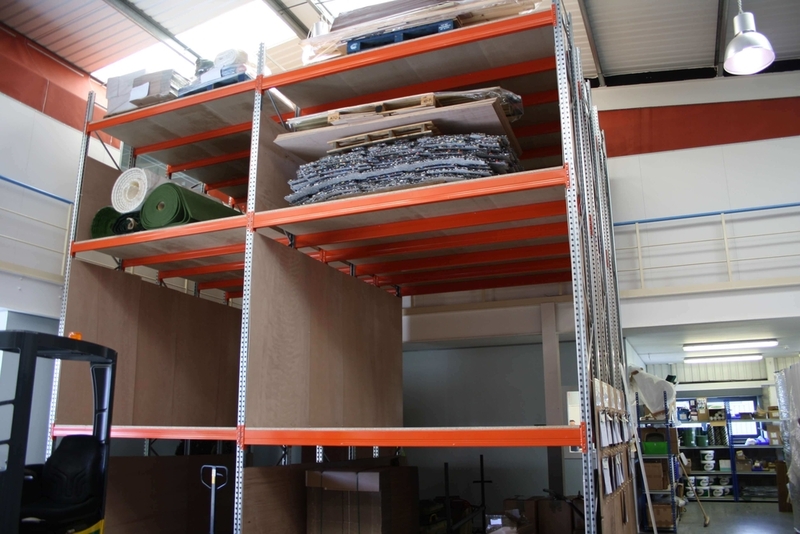 We can supply an extensive range of carpet racking systems to suit any long, bulky or awkward to store requirement. Click the button or call one of the team now on 0117 9555 211 to request a free quote. Why Choose BSE UK for your Carpet Racking? 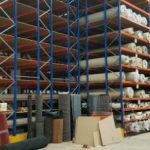 If you're not using carpet racking to store carpet, textile rolls and other long bulky options then not only are you using space inefficiently in your warehouse, but you could also be putting your stock at risk of damage through improper storage. Product is always visible, making for easier accessibility, stock and damage checks. 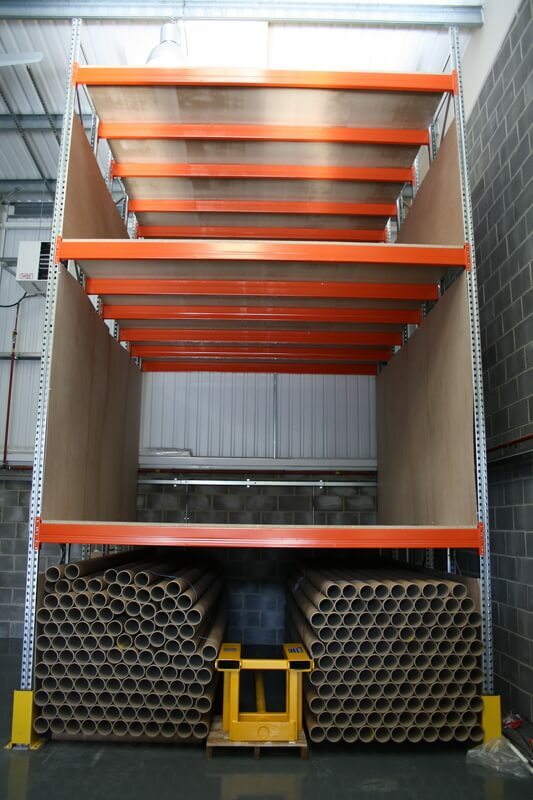 Beam levels can be set based on the height of the roll, maximising all available height in the warehouse. 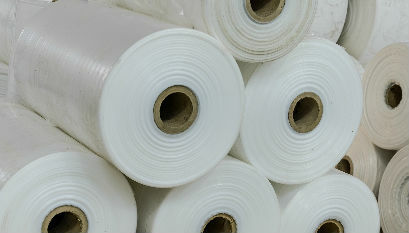 Can be re-configured and adjusted to suit carpet rolls of any width or diameter. Products are supported by multiple beams, reducing the risk of sagging, distortion or other damage. Faster and more efficient forklift loading and unloading, minimising product handling time and thus the potential for damage. 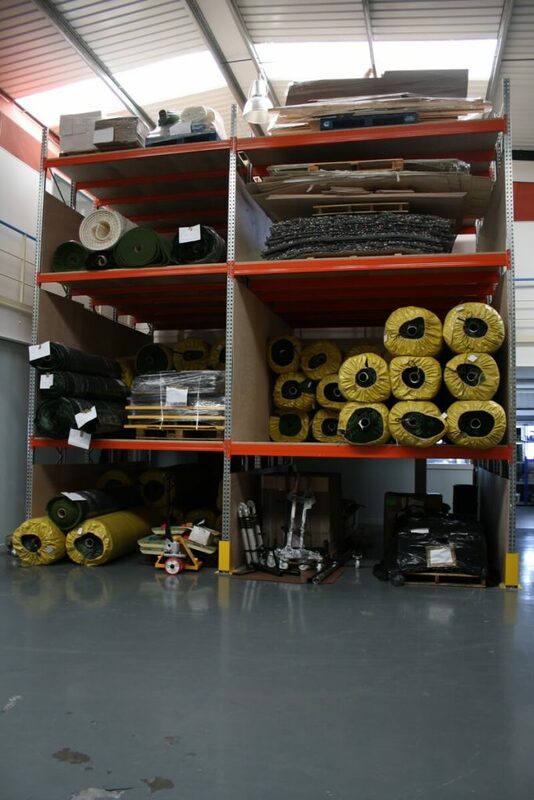 Being fully adjustable, carpet racking is a flexible solution for the storage of long and bulky items. Additionally, at BSE UK, we ensure that the carpet racking systems we provide are completely bespoke to your requirements - giving you an efficient solution which can be reconfigured to any future needs with ease. 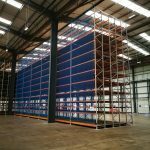 Following a free site survey from one of our racking experts, we'll recommend the right system for you based on your current and anticipated needs. Your new carpet racking system will then be installed at a time that suits you to minimise any disruption to your operation. 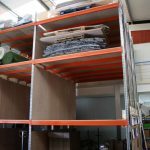 BSE UK were contacted by James at Pentagon Play when they had acquired a new warehouse in Thornbury, to accommodate their ever growing business..
"Being fully adjustable, carpet racking is a flexible solution for the storage of long and bulky items that can be adjusted to meet your ongoing needs. Click the button to email me directly and book in for a free site survey with one of our expert team." Unlike many dedicated racking suppliers, our installation teams are part of the Storage Equipment Installers Registration Scheme (SEIRS) meaning we can competently install your racking without the need for another contractor - increasing turnaround times and reducing overall installation costs. 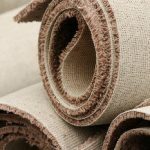 Additionally, we are members of the UK Warehousing Association (UKWA), meaning we're up to date with the latest legislation and industry best practice in regards to carpet racking. What Is Carpet Racking Suitable For? Fabrics such as carpets and other textiles. 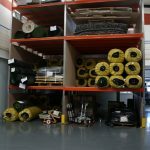 How Does Carpet Racking Prevent Damage to Stock? Adjustable beams to maximise space and reduce damage from stacking of stock. Multiple supporting beams to prevent bending damage. Product is always visible which can allow for visual inspection to be undertaken, saving time and reducing the risk of stock being damaged when taken down for inspection. Easy loading and unloading, preventing handling damage. Carpet racking beams can be decked with chipboard or timber to prevent damage further. Should I Buy Used Carpet Racking? We do not recommend buying used or second-hand carpet racking. In addition to the risk of unseen damage, due to the bespoke nature of carpet racking, you may find the system you buy is not suitable for the stock you have. 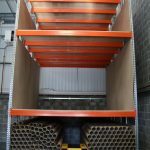 Find out more about the risks associated with using second hand pallet racking. How Can I Prevent Damage to my Carpet Racking? Neglecting regular maintenance and inspection of your carpet racking can result in damage, injury and even complete system collapse. 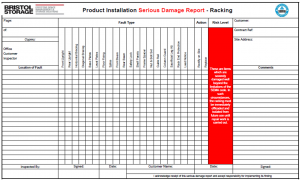 Carry out a regular visual inspection for damage, if you're the person responsible for this, download our free rack inspection checklist. Train staff to load and unload stock correctly. Install column guards to prevent damage from forklifts. Is Carpet Racking Installation Disruptive? 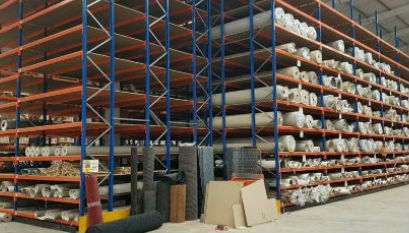 When properly planned, carpet racking can usually be achieved with zero downtime. At BSE UK, we arrange our installation times around you to ensure minimal disruption. Load notices and safety signs. 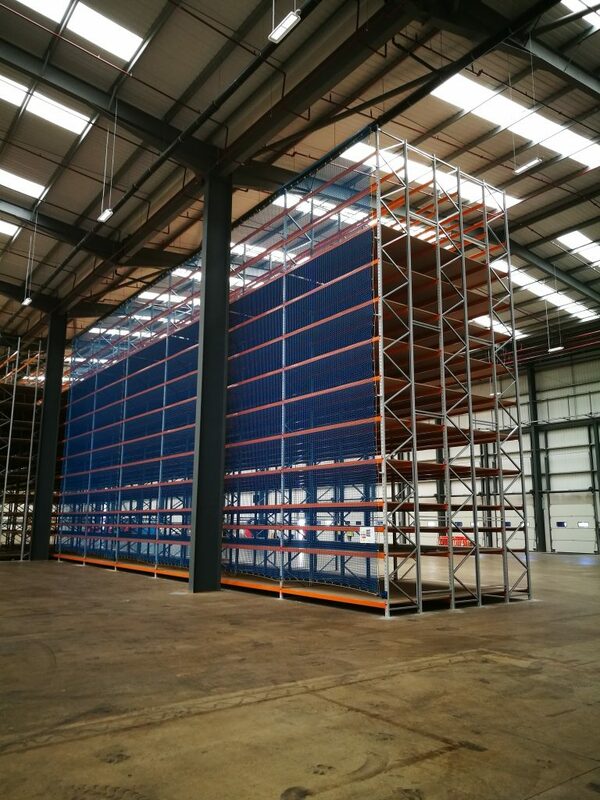 Are you looking for a robust solution for storing long, bulky or awkwardly shaped stock? If you require more information about our range, or are interested in booking a free site survey, contact one of our friendly team today on 0117 955 5211, fill out a contact form or use the live chat to discuss your individual requirements.